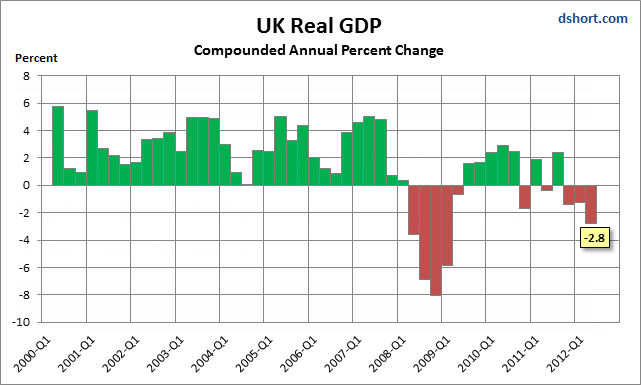 UK GDP Disaster Far Worse Than It Looks! The global recession picked up steam today with news of a UK GDP Shock. The economy shrank by 0.7pc in the second quarter – far more than the 0.2pc fall expected, as record rainfall and the Jubilee holiday added to pressure from austerity cuts and the eurozone debt crisis. It marks the third successive quarter of contraction, leaving Britain in its longest double-dip recession in more than 50 years. The Office for National Statistics showed broad-based weakness across the private sector, with construction output down 5.2pc, industrial production down 1.3pc and services output – which accounts for 77pc of the economy – falling 0.1pc. Only public-sector services output, and business services registered any growth. “I think it’s inconceivable that there’ll be positive growth this year,” said Gerard Lyons, chief economist at Standard Chartered, forecasting a 1.3pc fall in GDP. Victoria Clarke, economist at Investec, said the economy would now have to grow by 1.2pc in both the third and fourth quarters for the economy to expand by just 0.1pc in 2012 overall. In March, the Office for Budget Responsibility, the government’s independent fiscal watchdog, forecast 0.8pc growth this year, which now looks wildly optimistic. A drop of .7% might not seem that shocking in the US, but that’s because the US uses annualized reporting while most of the rest of the world does not. I asked Doug Short at Advisor Perspectives to show UK GDP as it would be presented in the US. Presented that way, UK GDP does look like a disaster. Of course the results were a disaster regardless of how presented, but the US peculiar method of reporting may not be obvious to US readers following European news.